Sorry for the lack of posts last week! With Stia being out of town, William and Henry keeping Jean busy and Katherine busy at work, there wasn’t much time for posting! It’s good to be back! We hope you were able to follow along on our Instagram feed and, for all of you requesting outfit details, Stia will be sharing her Maui outfits next week on the blog. Can you believe we are nearing the end of January? We’re looking forward to February- it’s so much fun with all the Valentine’s Day festivities. We’re really getting into it this year! So far we’ve ordered these plates for the boys, adorable pink throw pillows, this heart shaped pillow in cream, this cute velvet heart garland, a pink tassel garland and this pretty floral wreath for the front door. On Valentine’s Day we all keep it pretty low key with a special dinner at home. 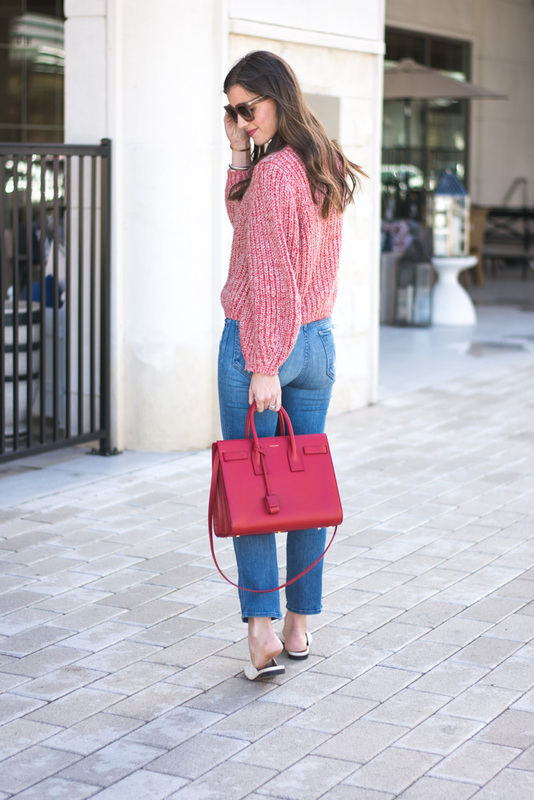 This red marled sweater is the perfect option for a low-key, cozy Valentine’s Day!